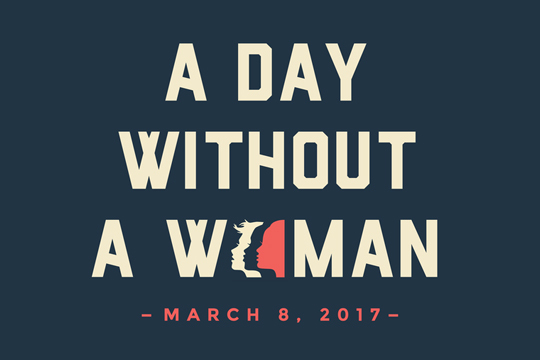 this wednesday, march 8, the organizers of the women’s march are calling for a women’s general strike. if there are any women who feel able or compelled to participate, here is some information about how. if you are unable to participate (or not a woman!) you can simply support the effort by wearing red that day or helping to spread the word about it, or by helping to enable those women that are acting to participate. i believe this general strike idea is a very powerful one. there’s been so many times when i've gone to france or spain or somewhere in the much more socialistic european landscape, and witnessed some kind of huge, powerful worker’s strike going on. the rail system is shut down or the busses or something equally dramatic and business as usual has been ground to a halt to call attention to some egregious issue. i long so much for us workers in america to achieve that sort of unity and ferocity. would it be possible for us to organize a real general strike to protest the trump administration?? or are we just too big and vast a nation? we would need the big labor unions on board. the auto workers, the farm workers, the transportation workers. we would need the tech companies and the schools... the financial sector would probably never join because they are too invested (pardon the pun) in any and every republican free ride. anyway... it is a lofty dream. (one i have every night now!) this action on march 8th is at least a nod to such a concept, a toe in the water.